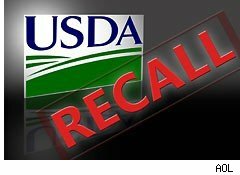 Carolina Pride Foods Inc. recalled more than nine tons of boneless, diced and fully cooked ham products sold in six states because they may be contaminated with listeria monocytogenes, said the U.S. Department of Agriculture. So far, no one has reported getting sick from eating the diced ham, sold under the brand names of Carolina Pride and Hardee's in stores in Alabama, Florida, Georgia, North Carolina, South Carolina and Tennessee. A list of retailers that carried the ham wasn't available, but the USDA's Food Safety and Inspection Service said it would release a list when it was compiled.Listeria can cause a potentially fatal infection in the very young, elderly or those with weakened immune systems; it has been linked to miscarriages and stillbirths. The infection can cause a high fever, severe headaches, neck stiffness and nausea. The U.S. Centers for Disease Control and Prevention said 1,600 people contract listeriosis each year and of those who do, 260 die. The potential contamination was discovered through microbiological testing by a company hired by Carolina Pride Foods. The company then opted to recall the 18,416 pounds of ham products. 10-ounce vacuum packages of Carolina Pride Smoked Diced Ham with a sell-by date of Sept. 23, 2011, that were sent to stores in Alabama, Florida, Georgia, North Carolina, South Carolina and Tennessee. 10-pound cases with five, 2-pound vacuum packages of Carolina Pride Diced Ham that were sent to locations in Georgia, North Carolina and South Carolina. 12-pound cases of 8-ounce vacuum packages of Hardee's Smoked Diced Ham with use-by dates of Nov. 9, 2011. That ham was sent to Florida, Georgia, North Carolina and South Carolina. Consumers can call Carolina Pride Food's vice president of sales, Lee Miles, at (864) 229-5611 for more information. Last summer, a New York company recalled 380,000 pounds of lunch meat used to make sandwiches sold at Walmart stores nationwide because the meat was potentially contaminated with listeria.